Author: Ronald P. Schaefer, Francis O. Egbokhare. Series edited by: Herrmann Jungraithmayr, Norbert Cyffer, Rainer Voßen. 12 pp. Roman, 552 pp. Emai - belonging to the Edoid branch of the Niger-Congo language family – is a language of approximately 30,000 to 40,000 members of the Emai clan in South Central Nigeria. It is spoken in ten villages across roughly 250 km² on the plateau between the Edion and Owan rivers of present-day Edo State. This Emai-speaking region is about 120 km north of Benin City and consists primarily of tree savanna, allowing for bush agriculture. As a linguistic entity, Emai is completely surrounded by Edoid speech varieties. Its genetic classification as a distinct linguistic unit within Edoid is of recent origin, nevertheless broader classificatory schemes have accepted the dialect cluster interpretation, locating Emai more specifically within the North Central branch of Edoid. Linguistic investigation of individual languages within the Edoid group is extremely limited. No descriptive grammatical treatment, encompassing reference grammar, lexicon, and texts, has appeared for a single member of the 25 or so Edoid languages. Word lists of various kinds are available but dictionaries exist only for Bini. This dictionary represents the first published lexical record of the Emai people of Southern Nigeria. It reflects most directly linguistic fieldwork undertaken by the two authors at regular intervals from 1994 to 2004, although it also incorporates lexical material gathered since 1983. 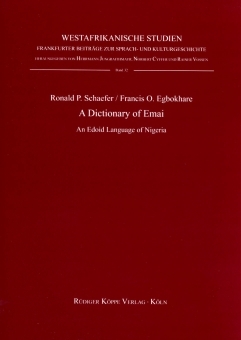 Since the second author – Francis O. Egbokhare – is a native speaker of Emai, his lexical intuitions over a number of years serve as a filter for information obtained from other Emai speakers. The work contains a grammatical sketch, first describing the orthography and pronunciation followed by brief analyses of the word classes, clause structure as well as the tonal variations in this language. The presentation of the lexical entries is also elaborately explained in this first part of the dictionary. [...] the authors are to be congratulated in focussing on bringing out a substantial dictionary of a relatively unstudied language in a rather neglected group.